Whether you’re an advanced surfer or brand new to surfing, it always helps to know exactly what goes into and what you should be looking for when buying a wetsuit for surfing. Wetsuits will not keep you completely dry. The idea is to allow a small amount of water inside, your body heat will take care of the rest. Okay, back to how to buy a surfing wetsuit! We put together a guide of the four factors to look for in a surfing wetsuit. These four factors include wetsuit thickness, type of neoprene, wetsuit seam construction, and extras. Have any suggestions? Let us know in the comments what you look for in a surfing wetsuit! Neoprene types impact flexibility and there are two types for surfing wetsuits: Standard and Super stretch. Manufacturers use varying degrees of these neoprene types, so for surfing, you need at least 30% super stretch neoprene in your wetsuit. Seasoned surfers prefer wetsuits with 60% to 100% super stretch neoprene for the ultimate in flexibility and fit. 30% stretch: the back, shoulders, and arms have 30% super stretch neoprene while the other 70% of the suit is made with standard neoprene. 100% stretch: entire suit is made with super stretch neoprene for the ultimate in fit and flexibility. What holds the suit together? Seams! Seam construction impacts the warmth and comfort of the wetsuit and can be broken down into three types. Flatlock: Great for warmer water temps (62F & up), flatlock seams look like railroad tracks and the interior and exterior look the same. The interior is flat and is comfortable against the skin. Some water seeps in through this type of seam. Sealed (Glued & Blindstitched): This type of seam works well in cold water (55F & up). The seam is constructed by being glued first and then stitched. The exterior is similar to flatlock seams, but the interior is glued. Very little water will seep through this type. Sealed & Taped (Glued Blindstitched & 100% Taped): These seams work well for really cold water (55F & below). It has the same construction as Sealed, but has taping on the interior and exterior. This tape reinforces seams for added durability and prevents any water from seeping in. Watch the video below for more information on seam types! Extra internal and external features will enhance the performance of your wetsuit. Poly fleece and quick dry poly fleece are internal linings that provide a quick drying time and keep you warmer, longer. There’s even quick dry poly fleece for an even faster drying time! Surfing wetsuits can come in a variety of zipper types and are offered as a back zip, front zip (or chest zip), or zip free. Full-Zipper provides your standard entry. Short-Zipper increases flexibility and limits water entry though the zipper. A chest zipper increases your flexibility and is becoming more popular and prominent in the surfing wetsuit industry. Zipper barriers are great for flushing water out of the zipper area! Smoothskin neoprene a.k.a smoothy is a rubberized coating applied to the outside of neoprene that helps block wind, and resists water absorbtion into the wetsuit. Smoothy is typically found on the chest of a wetsuit. Specialized windsports wetsuits feature more smoothy for better windblock. Pros: wind resistance, better “cling” to a surfboard, blocks some water from entering the suit. Cons: adds a little extra weight to the suit, smoothy is delicate and shows nicks/cuts easily. Key pockets or key loops are added as a convenience to most wetsuits. See the brief video below to learn more! Ready to shop for your surfing wetsuit? Shop men’s surfing wetsuits, women’s surfing wetsuits, and kid’s surfing wetsuits. Do you have a sleeveless vest? Yes we do! Check out our selection of wetsuit vests here: https://www.wetsuitwearhouse.com/search.html#/?_=1&filter.gender=Men%27s&page=1&filter.suit_type=Vests. Thank you! In Pensacola, FL area. Looking for a versatile wet-suit (both SCUBA and surfing) for 17 year old son who seems to have near zero body fat (gets cold quick in water). Sure options can never be perfect when looking for versatility, but open to recommendations. I haven’t reviewed all your web page tutorials just yet, but thought I’d ask sooner then later. I’m thinking the coldest temps he will be in the water will be above 66 F……. Sadly, there is no one wetsuit that will work for both SCUBA and surfing. You will need a much thicker wetsuit for SCUBA. If you don’t do well with cold water, you should try a 7mm fullsuit for diving: https://www.wetsuitwearhouse.com/wetsuits/category/mens-wetsuits-general.html#/filter:sports_combined:SCUBA/filter:thickness:7mm/filter:suit_type:Fullsuits. As far as a wetsuit for surfing goes, try a 3/2mm sealed fullsuit: https://www.wetsuitwearhouse.com/wetsuits/category/mens-fullsuits-32.html#/filter:seam:Sealed/filter:seam:Sealed$2520$2526$2520Taped. Again though, it is not possible to buy one wetsuit for SCUBA and surfing, they have to be separate. Thank you! Hi, I need another wetsuit.i believe I bought one from you 3-4 tears ago , it was stolen.could you please look it up? Sorry, we can’t find you in our order history. However, here’s our 4/3mm Rip Curl fullsuit selection if you want to check it out: https://www.wetsuitwearhouse.com/wetsuits/category/rip-curl-wetsuits.html#/filter:gender:Men's/filter:suit_type:Fullsuits/filter:thickness:4$252F3mm. Thank you! I’m interested in getting a full hooded wetsuit for surfing off the Oregon Coast. Could you send me some ideas of a good suit for this purpose? We have a good selection of full hooded wetsuits for surfing! Check out this link which has our men’s hooded fullsuit selection: https://www.wetsuitwearhouse.com/wetsuits/category/hooded-wetsuits.html#/filter:gender:Men's. We have no complaints about any of these brands, so it’s up to you which one you decide to go with. They all have great tech features to keep you warm while performing on the water. It also depends on your price range. Feel free to contact our customer service team either via live chat, email (service@wetsuitwearhouse.com) or call 866-906-7848 if you have any more questions. Thank you! can you tell me if anyone makes a sealed seam 2/2 full suit? 2mm sealed fullsuits aren’t very common to come by. We have a 2.5mm sealed and taped fullsuit from Patagonia, but that’s it. We apologize! If interested, here’s the Patagonia suit (but it’s on closeout and the sizing is very, very limited): https://www.wetsuitwearhouse.com/PROD/88432.html. Thank you for reaching out about this! Hi I want to ride my jet ski earlier this year and the water temps in Lake Erie will be in the mid 30’s when the ice is gone. What thickness would you recommend? Also at what water temp would you go to something lighter? 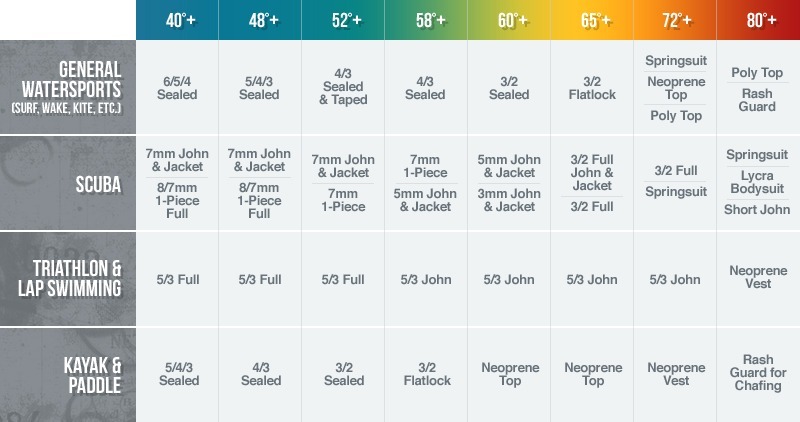 If the air is warmish, say around 50 degrees F and up, you should take a look at some 5/4/3 non-hooded (https://www.wetsuitwearhouse.com/wetsuits/category/mens-fullsuits-5.html) or 4/3mm wetsuits(https://www.wetsuitwearhouse.com/wetsuits/category/mens-fullsuits-43.html). I would also recommend that you consider boots and gloves (if you don’t have any), especially if the air temps are cold. Thanks and hope that helps! Let us know if you need additional assistance.